miniOrange provides a ready to use solution for Palo Alto Platform. This solution ensures that you are ready to roll out secure access to Palo Alto to your employees within minutes. Palo Alto provides Global Protect system which connects to the Virtual Private Network (VPN) at UMass Amherst. It provides an encrypted connection between your campus network and off-campus computer. You can enable two-factor authentication (2FA) for your Palo Alto managed active directory to increase security level. When you enable 2FA, your users enter their username and password (first factor) as usual, and they have to enter an authentication code (the second factor) which will share on your virtual or hardware 2FA solution. To enable 2FA you can enable RADIUS authentication in Palo Alto and configure policies in miniOrange to enable or disable 2FA for users. miniOrange accomplishes this by acting as a RADIUS server, that accepts the username/password of the user entered as a RADIUS request, validates the user against the user store as Active Directory ( AD ), prompts him for the 2-factor authentication and either grants/revokes access based on the input by the user. The 2-factor authentication can be of two types depending on the VPN clients. VPN Clients that support RADIUS Challenge. VPN Clients that do not support RADIUS Challenge. 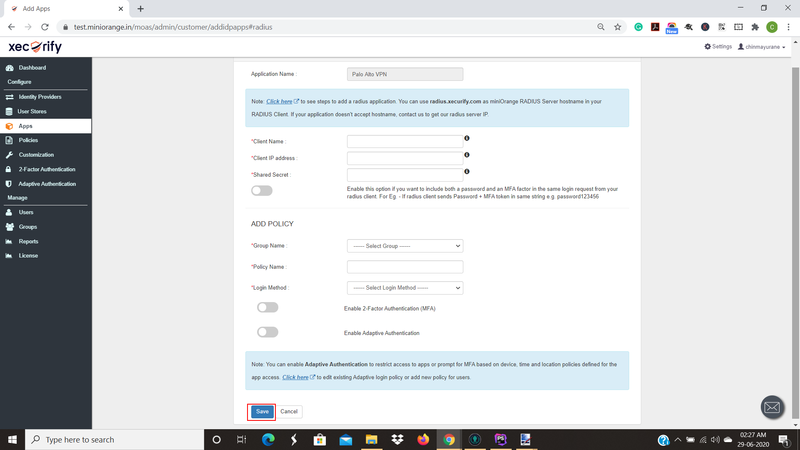 First step is user's username & password get validated against the credentials stored in Active Directory and 2nd request sends a success response, this request is sent to validate the 2-factor authentication of the user, on successful authentication user is granted access to the application. Authentication methods : All Authentication methods supported by miniOrange. Software Token, Push Notification, OTP over Email to name a few. Guidelines to configure RADIUS authentication in Palo Alto with miniOrange. Login into the Admin Dashboard. Click on Apps >> Manage Apps. Select Radius tab and select Radius Client. Configure details below to add Radius Client. Click on Policies tab >> App Authentication Policy. Click on Add Policy tab. In Step 1 Select “Palo Alto” in Application section. In Step 2 Select “DEFAULT” in Group Name and enter Policy name as “Palo Alto” add policy then Select First factor as “PASSWORD”. Enable Second factor then click on Save. Select User Stores then click on Add User Store. Select “AD/LDAP” tab and configure it with your LDAP settings. Bind Account DN Click on AD FS>>Domain>>respective Users>> Properties>>Attribute Editor then copy the value of distinguishedName & paste it against Bind Account DN. Enable “Active LDAP” and “Sync user in miniOrange” option and click on save. Click on Test Configuration to check whether your LDAP configuration details are right and LDAP server is reachable. It will ask for test username & password from LDAP directory. After this, it will show you the list of User stores. Click on “ Make Default “. 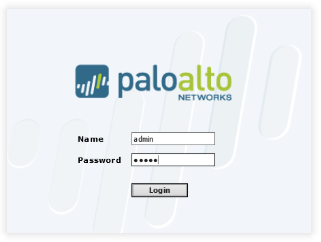 Log in to the Palo Alto administrative interface. Click on Device tab >> Services Profiles, then RADIUS. Click the on Add button to add a new RADIUS server profile. In the "Name" field, enter miniOrange RADIUS (or another descriptive name). Increase the "Timeout" to at least 30 (120 recommended if using push notification, Out of band authentication methods or phone authentication). Change the "Authentication Protocol" to PAP. PAN-OS 7.x users must set the protocol in the CLI with this command: set authentication radius-auth-type pap. Server Type in miniOrange RADIUS or any name you prefer. Click on Device tab >> Authentication Profile. Name Enter miniOrange or any name you prefer. Server Profile Select miniOrange RADIUS (or whatever name used to create the RADIUS Server Profile). Username Modifier (Optional) If this is blank (or set to %USERINPUT%) then the user's input is unmodified. 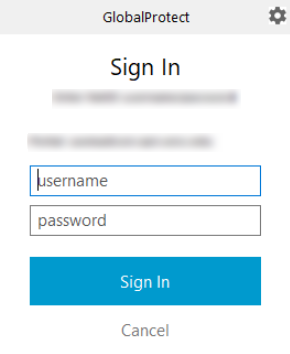 You can prepend or append the value of User Domain (as %USERDOMAIN%) to pre-configure the username input. Learn more about this setting in the GlobalProtect documentation. Click on Advanced >> "Allow List"
Click On the Network tab >> GlobalProtect >> Gateways. 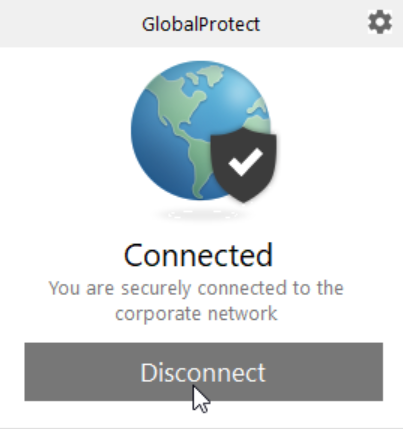 Click on your configured GlobalProtect Gateway. Click on the Authentication tab,A then select the miniOrange authentication. Click on Agent >> Client Settings tab. Click on the name of your configuration to open it. Click on Ok (twice if case if you also enabled authentication override cookies) to save the GlobalProtect Gateway settings. It will prompt you for 2 Factor code if you have enabled 2-factor authentication in miniOrange policy. Enter your 2-Factor code and you should be connected to VPN.